Lately I have been reading a lot about the Paleocene-Eocene Thermal Maximum, or PETM, which is my favourite paleoclimatic event (is it weird to have a favourite?) This episode of rapid global warming 55 million years ago is particularly relevant to our situation today, because it was clearly caused by greenhouse gases. Unfortunately, the rest of the story is far less clear. The PETM happened about 10 million years after the extinction that killed the dinosaurs. The Age of Mammals was well underway, although humans wouldn’t appear in any form for another few million years. It was several degrees warmer, to start with, than today’s conditions. 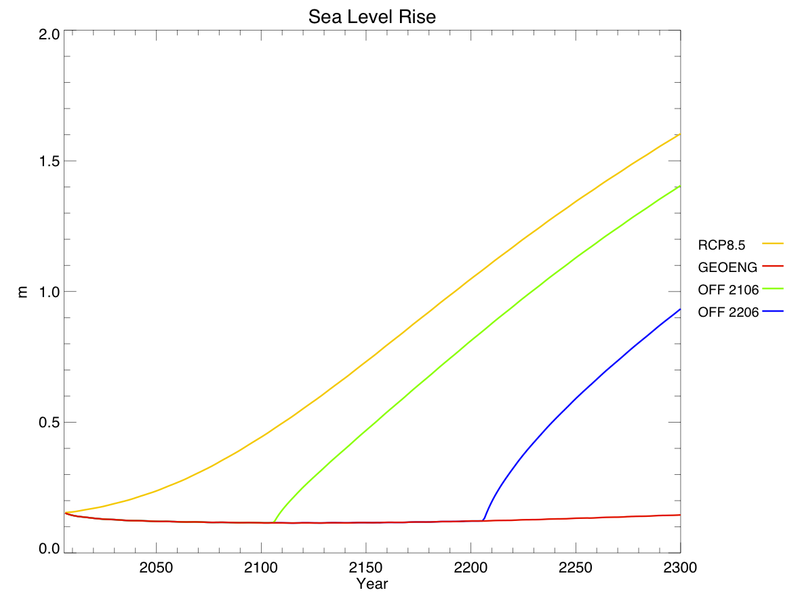 Sea levels would have been higher, and there were probably no polar ice caps. Then, over several thousand years, the world warmed by between 5 and 8°C. It seems to have happened in a few bursts, against a background of slower temperature increase. Even the deep ocean, usually a very stable thermal environment, warmed by at least 5°C. It took around a hundred thousand years for the climate system to recover. Such rapid global warming hasn’t been seen since, although it’s possible (probable?) that human-caused warming will surpass this rate, if it hasn’t already. It is particularly troubling to realize that our species has never before experienced an event like the one we’re causing today. The climate has changed before, but humans generally weren’t there to see it. The PETM is marked in the geological record by a sudden jump in the amount of “light” carbon in the climate system. Carbon comes in different isotopes, two of which are most important for climate analysis: carbon with 7 neutrons (13C), and carbon with 6 neutrons (12C). Different carbon cycle processes sequester these forms of carbon in different amounts. Biological processes like photosynthesis preferentially take 12C out of the air in the form of CO2, while geological processes like subduction of the Earth’s crust take anything that’s part of the rock. When the carbon comes back up, the ratios of 12C to 13C are preserved: emissions from the burning of fossil fuels, for example, are relatively “light” because they originated from the tissues of living organisms; emissions from volcanoes are more or less “normal” because they came from molten crust that was once the ocean floor. In order to explain the isotopic signature of the PETM, you need to add to the climate system either a massive amount of carbon that’s somewhat enriched in light carbon, or a smaller amount of carbon that’s extremely enriched in light carbon, or (most likely) something in the middle. The carbon came in the form of CO2, or possibly CH4 that soon oxidized to form CO2. That, in turn, almost certainly caused the warming. There was a lot of warming, though, so there must have been a great deal of carbon. We don’t know exactly how much, because the warming power of CO2 depends on how much is already present in the atmosphere, and estimates for initial CO2 concentration during the PETM vary wildly. However, the carbon injection was probably something like 5 trillion tonnes. This is comparable to the amount of carbon we could emit today from burning all our fossil fuel reserves. That’s a heck of a lot of carbon, and what nobody can figure out is where did it all come from? Arguably the most popular hypothesis is methane hydrates. On continental shelves, methane gas (CH4) is frozen into the ocean floor. Microscopic cages of water contain a single molecule of methane each, but when the water melts the methane is released and bubbles up to the surface. Today there are about 10 trillion tonnes of carbon stored in methane hydrates. In the PETM the levels were lower, but nobody is sure by how much. The characteristics of methane hydrates seem appealing as an explanation for the PETM. They are very enriched in 12C, meaning less of them would be needed to cause the isotopic shift. They discharge rapidly and build back up slowly, mirroring the sudden onset and slow recovery of the PETM. The main problem with the methane hydrate hypothesis is that there might not have been enough of them to account for the warming observed in the fossil record. However, remember that in order to release their carbon, methane hydrates must first warm up enough to melt. So some other agent could have started the warming, which then triggered the methane release and the sudden bursts of warming. There is no geological evidence for any particular source – everything is speculative, except for the fact that something spat out all this CO2. 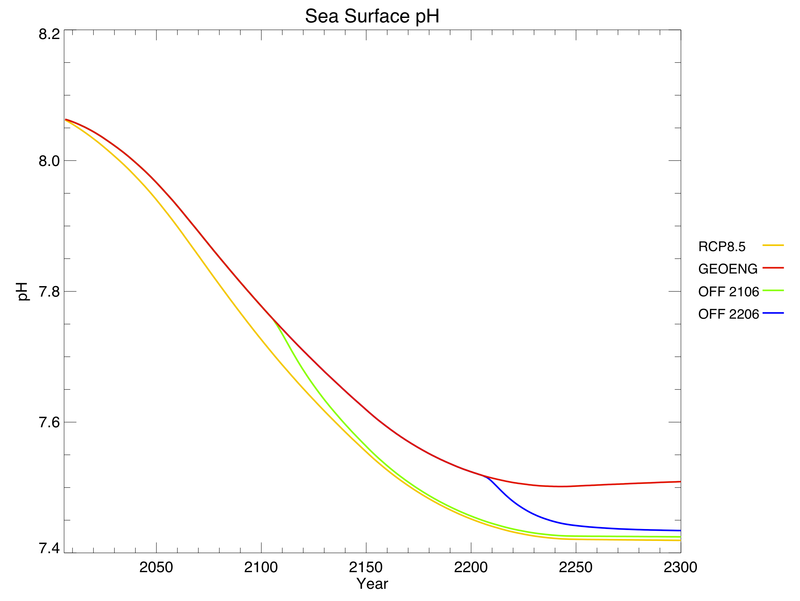 Don’t forget that where there is greenhouse warming, there is ocean acidification. The ocean is great at soaking up greenhouse gases, but this comes at a cost to organisms that build shells out of calcium carbonate (CaCO3, the same chemical that makes up chalk). CO2 in the water forms carbonic acid, which starts to dissolve their shells. Likely for this reason, the PETM caused a mass extinction of benthic foraminifera (foraminifera = microscopic animals with CaCO3 shells; benthic = lives on the ocean floor). Other groups of animals seemed to do okay, though. There was a lot of rearranging of habitats – species would disappear in one area but flourish somewhere else – but no mass extinction like the one that killed the dinosaurs. The fossil record can be deceptive in this manner, though, because it only preserves a small number of species. By sheer probability, the most abundant and widespread organisms are most likely to appear in the fossil record. There could be many organisms that were less common, or lived in restricted areas, that went extinct without leaving any signs that they ever existed. Climate modellers really like the PETM, because it’s a historical example of exactly the kind of situation we’re trying to understand using computers. If you add a few trillion tonnes of carbon to the atmosphere in a relatively short period of time, how much does the world warm and what happens to its inhabitants? The PETM ran this experiment for us in the real world, and can give us some idea of what to expect in the centuries to come. If only it had left more data behind for us to discover. Near the end of my summer at the UVic Climate Lab, all the scientists seemed to go on vacation at the same time and us summer students were left to our own devices. I was instructed to teach Jeremy, Andrew Weaver’s other summer student, how to use the UVic climate model – he had been working with weather station data for most of the summer, but was interested in Earth system modelling too. Jeremy caught on quickly to the basics of configuration and I/O, and after only a day or two, we wanted to do something more exciting than the standard test simulations. Remembering an old post I wrote, I dug up this paper (open access) by Damon Matthews and Ken Caldeira, which modelled geoengineering by reducing incoming solar radiation uniformly across the globe. We decided to replicate their method on the newest version of the UVic ESCM, using the four RCP scenarios in place of the old A2 scenario. We only took CO2 forcing into account, though: other greenhouse gases would have been easy enough to add in, but sulphate aerosols are spatially heterogeneous and would complicate the algorithm substantially. Since we were interested in the carbon cycle response to geoengineering, we wanted to prescribe CO2 emissions, rather than concentrations. 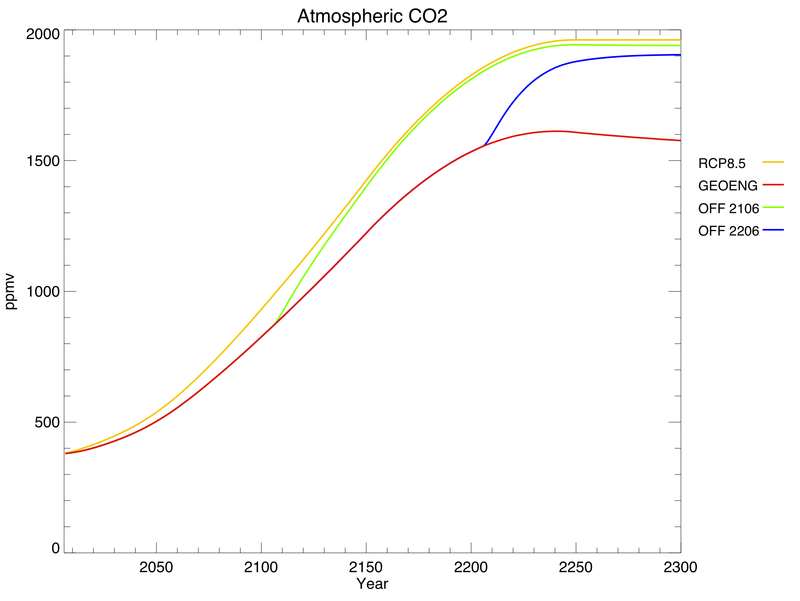 However, the RCP scenarios prescribe concentrations, so we had to run the model with each concentration trajectory and find the equivalent emissions timeseries. Since the UVic model includes a reasonably complete carbon cycle, it can “diagnose” emissions by calculating the change in atmospheric carbon, subtracting contributions from land and ocean CO2 fluxes, and assigning the residual to anthropogenic sources. After a few failed attempts to represent geoengineering without editing the model code (e.g., altering the volcanic forcing input file), we realized it was unavoidable. Model development is always a bit of a headache, but it makes you feel like a superhero when everything falls into place. The job was fairly small – just a few lines that culminated in equation 1 from the original paper – but it still took several hours to puzzle through the necessary variable names and header files! Essentially, every timestep the model calculates the forcing from CO2 and reduces incoming solar radiation to offset that, taking changing planetary albedo into account. When we were confident that the code was working correctly, we ran all four RCPs from 2006-2300 with geoengineering turned on. The results were interesting (see below for further discussion) but we had one burning question: what would happen if geoengineering were suddenly turned off? By this time, having completed several thousand years of model simulations, we realized that we were getting a bit carried away. But nobody else had models in the queue – again, they were all on vacation – so our simulations were running three times faster than normal. Using restart files (written every 100 years) as our starting point, we turned off geoengineering instantaneously for RCPs 6.0 and 8.5, after 100 years as well as 200 years. It only took about 20 years for average global temperature to fall back to preindustrial levels. Changes in solar radiation definitely work quickly. 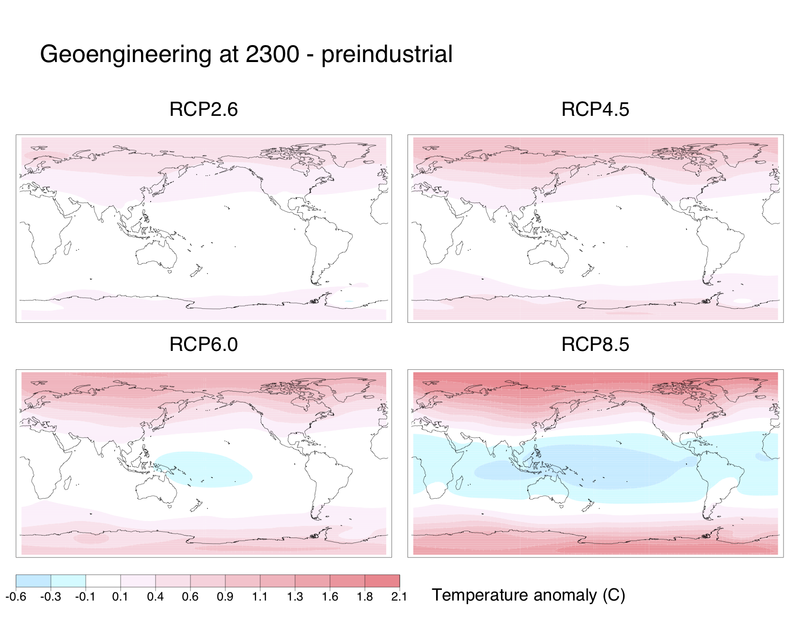 Unfortunately, changes in the other direction work quickly too: shutting off geoengineering overnight led to rates of warming up to 5 C / decade, as the climate system finally reacted to all the extra CO2. To put that in perspective, we’re currently warming around 0.2 C / decade, which far surpasses historical climate changes like the Ice Ages. 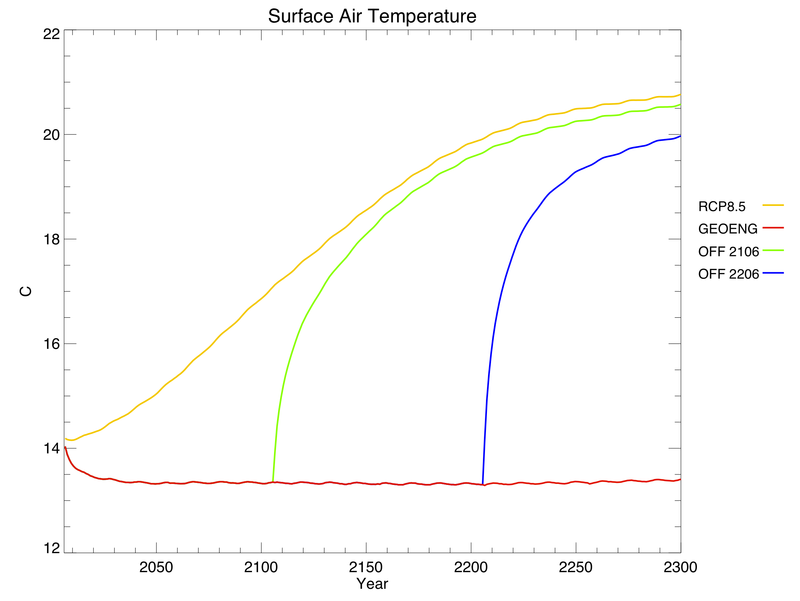 Sea level rise (due to thermal expansion only – the ice sheet component of the model isn’t yet fully implemented) is directly related to temperature, but changes extremely slowly. When geoengineering is turned off, the reversals in sea level trajectory look more like linear offsets from the regular RCP. Sea ice area, in contrast, reacts quite quickly to changes in temperature. Note that this data gives annual averages, rather than annual minimums, so we can’t tell when the Arctic Ocean first becomes ice-free. 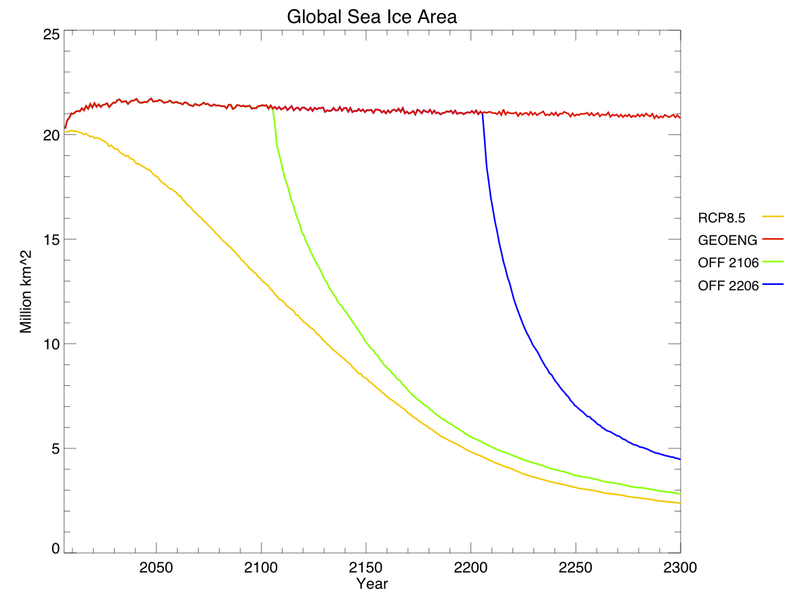 Also, note that sea ice area is declining ever so slightly even with geoengineering – this is because the poles are still warming a little bit, while the tropics cool. 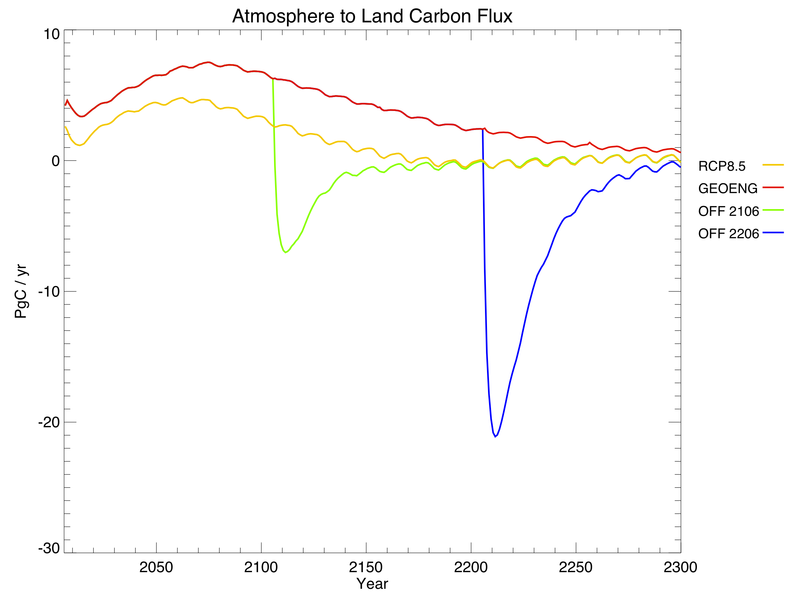 In this graph, positive values mean that the land is a net carbon sink (absorbing CO2), while negative values mean it is a net carbon source (releasing CO2). Note the large negative spikes when geoengineering is turned off: the land, adjusting to the sudden warming, spits out much of the carbon that it had previously absorbed. 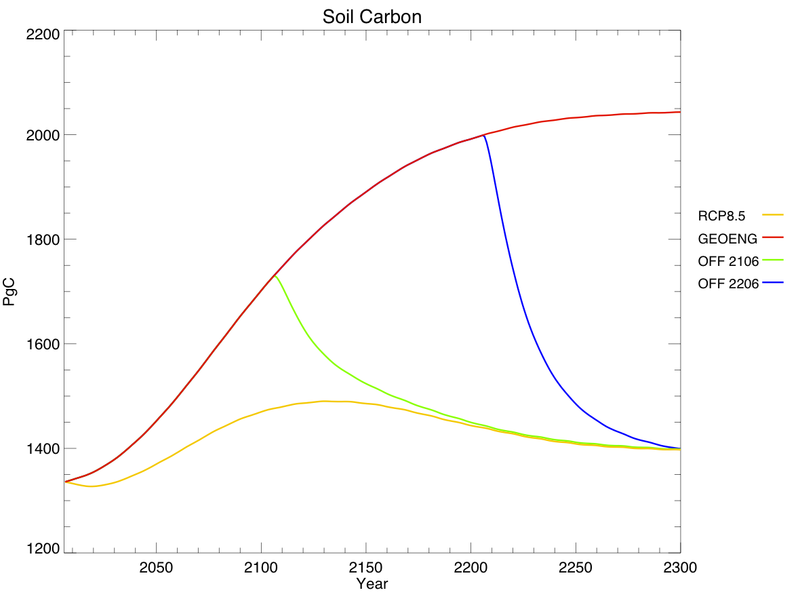 This graph shows total carbon content, rather than fluxes – think of it as the integral of the previous graph, but discounting vegetation carbon. Finally, the lower atmospheric CO2 led to lower dissolved CO2 in the ocean, and alleviated ocean acidification very slightly. Again, this benefit quickly went away when geoengineering was turned off. Is geoengineering worth it? I don’t know. I can certainly imagine scenarios in which it’s the lesser of two evils, and find it plausible (even probable) that we will reach such a scenario within my lifetime. But it’s not something to undertake lightly. As I’ve said before, desperate governments are likely to use geoengineering whether or not it’s safe, so we should do as much research as possible ahead of time to find the safest form of implementation. 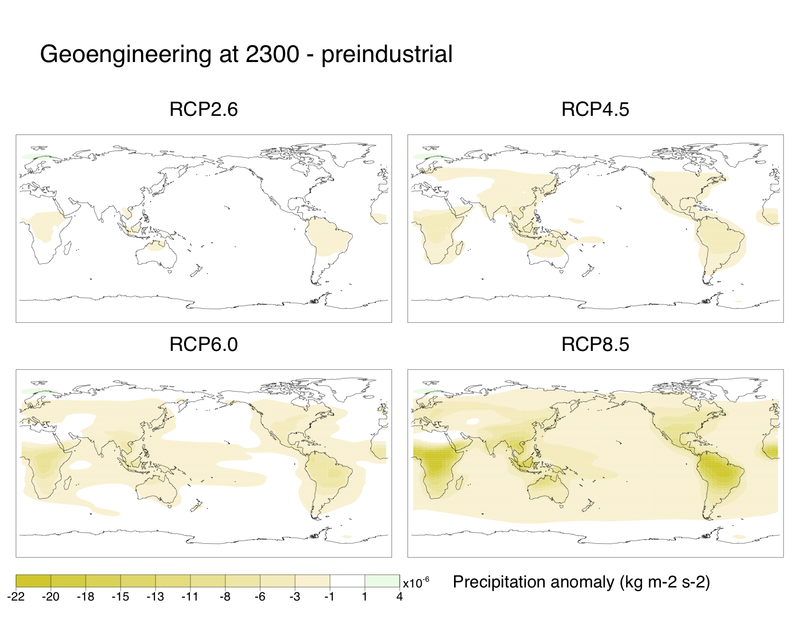 The modelling of geoengineering is in its infancy, and I have a few ideas for improvement. In particular, I think it would be interesting to use a complex atmospheric chemistry component to allow for spatial variation in the forcing reduction through sulphate aerosols: increase the aerosol optical depth over one source country, for example, and let it disperse over time. I’d also like to try modelling different kinds of geoengineering – sulphate aerosols as well as mirrors in space and iron fertilization of the ocean. Jeremy and I didn’t research anything that others haven’t, so this project isn’t original enough for publication, but it was a fun way to stretch our brains. It was also a good topic for a post, and hopefully others will learn something from our experiments. Above all, leave over-eager summer students alone at your own risk. They just might get into something like this.